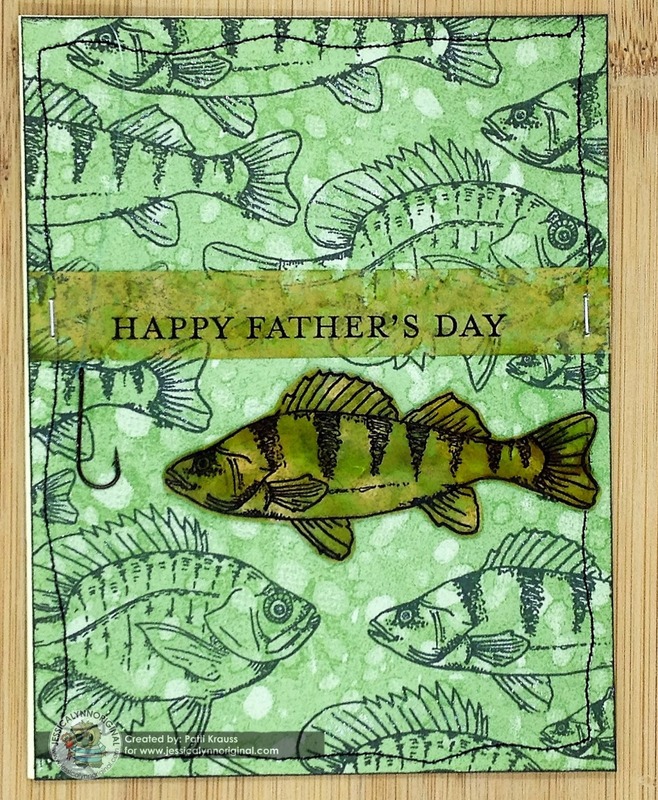 Hi Friends: It's time for my next project using the new Fishing At Phantom Lake Wisconsin Happy Father's Day Fish stamp set from JessicaLynnOriginal stamps. This amazing masculine stamp set is available for pre-order until April 22nd at a discount of $2.65 off the regular price. In case you missed it yesterday, here's a picture of the full stamp set - these are really great stamps for a masculine card! We would love to see what you do with this set, if you want to post them up on Jessica's Facebook page. See below for instructions and supplies for this card - it's pretty CAS for me, but I loved using the Alcohol Inks. Thanks for visiting - hope you have a great crafty day! Stamp fish randomly with black ink on A2 size piece of green water spot paper to create the fish background paper. Stitch around the edges of the paper with sewing machine and ink edges. For a bit of texture, use the Glitter Brush clear pen to add some shimmer to all of the fins - hard to see in the photo, because the transparencies kept trying to shine too much. On a piece of acetate / transparency, stamp the large perch image with StazOn ink and fussy cut it. On the opposite side of the acetate, use Alcohol Ink applicator and green and gold inks to color the fish - just pounce the applicator around the acetate to create this fun effect. Stamp the sentiment onto an acetate / transparency strip with StazOn ink, then use the same Alcohol Inks to color the strip. Staple the strip to the stamped card background. Thread a fish hook with fishing line and dangle down the left edge of the card front, then adhere the card front to the card base. Finish by adding the acetate fish to the card front using clear foam adhesive. Love this one too! The stitching and love the "background"... this is handsomely beautiful!